The Sussex Spaniel was among the first ten breeds to be recognized and admitted to the Stud Book when the American Kennel Club was formed in 1884, but it has existed as a distinct breed for much longer. As its name implies, it derives its origin from the county of Sussex, England, and it was used there since the eighteenth century as a field dog. During the late 1800's the reputation of the Sussex Spaniel as an excellent hunting companion was well known among the estates surrounding Sussex County. Its short legs, massive build, long body, and habit of giving tongue when on scent made the breed ideally suited to penetrating the dense undergrowth and flushing game within range of the gun. Strength, maneuverability, and desire were essential for this purpose. Although it has never gained great popularity in numbers, the Sussex Spaniel continues today essentially unchanged in character and general appearance from those 19th century sporting dogs. The Sussex Spaniel presents a long and low, rectangular and rather massive appearance coupled with free movements and nice tail action. The breed has a somber and serious expression. The rich golden liver color is unique to the breed. Size-The height of the Sussex Spaniel as measured at the withers ranges from 13 to 15 inches. Any deviation from these measurements is a minor fault. The weight of the Sussex Spaniel ranges between 35 and 45 pounds. 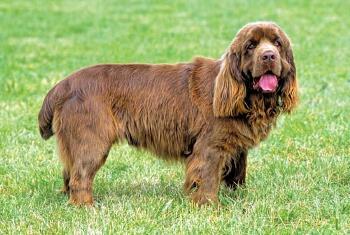 Proportion-The Sussex Spaniel presents a rectangular outline as the breed is longer in body than it is tall. Substance-The Sussex Spaniel is muscular and rather massive. Correct head and expression are important features of the breed. Eyes-The eyes are hazel in color, fairly large, soft and languishing, but do not show the haw overmuch. Expression-The Sussex Spaniel has a somber and serious appearance, and its fairly heavy brows produce a frowning expression. Ears-The ears are thick, fairly large, and lobe-shaped and are set moderately low, slightly above the outside corner of the eye. Skull and Muzzle-The skull is moderately long and also wide with an indentation in the middle and with a full stop. The brows are fairly heavy, the occiput is full but not pointed, the whole giving an appearance of heaviness without dullness. The muzzle should be approximately three inches long, broad, and square in profile. The skull as measured from the stop to the occiput is longer than the muzzle. The nostrils are well-developed and liver colored. The lips are somewhat pendulous. Bite-A scissors bite is preferred. Any deviation from a scissors bite is a minor fault. Neck-The neck is rather short, strong, and slightly arched, but does not carry the head much above the level of the back. There should not be much throatiness about the skin. Topline and Body-The whole body is characterized as low and long with a level topline. The chest is round, especially behind the shoulders, and is deep and wide which gives a good girth. The back and loin are long and very muscular both in width and depth. For this development, the back ribs must be deep. Tail-The tail is docked from 5 to 7 inches and set low. When gaiting the Sussex Spaniel exhibits nice tail action, but does not carry the tail above the level of the back. Rich golden liver is the only acceptable color and is a certain sign of the purity of the breed. Dark liver or puce is a major fault. White on the chest is a minor fault. White on any other part of the body is a major fault. The round, deep and wide chest of the Sussex Spaniel coupled with its short legs and long body produce a rolling gait. While its movement is deliberate, the Sussex Spaniel is in no sense clumsy. Gait is powerful and true with perfect coordination between the front and hind legs. The front legs do not paddle, wave, or overlap. The head is held low when gaiting. The breed should be shown on a loose lead so that its natural gait is evident. Despite its somber and serious expression, the breed is friendly and has a cheerful and tractable disposition. The standard ranks features of the breed into three categories. The most important features of the breed are color and general appearance. The features of secondary importance are the head, ears, back and back ribs, legs, and feet. The features of lesser importance are the eyes, nose, neck, chest and shoulders, tail, and coat. Faults also fall into three categories. Major faults are color that is too light or too dark, white on any part of the body other than the chest, and a curled coat. Serious faults are a narrow head, weak muzzle, the presence of a topknot, and a general appearance that is sour and crouching. Minor faults are light eyes, white on chest, the deviation from proper height ranges, lightness of bone, shortness of body or a body that is flatsided, and a bite other than scissors. There are no disqualifications in the Sussex Spaniel standard. Click Here to Learn about breeder background checks on Sussex Spaniel breeders if you are looking for Sussex Spaniel puppies for sale. Click Here to learn how ResearchBreeder.com can help you find healthy Sussex Spaniel puppies for sale.Sussex Spaniel puppies for sale. Click Here to order a Breeder or Kennel Background Check on Sussex Spaniel Breeders that may have Sussex Spaniel puppies for sale. Click here to find the national breed club for Sussex Spaniel puppies for sale. Click Here to purchase a list of approved ResearchBreeder.com Sussex Spaniel Breeders who have Sussex Spaniel puppies for sale.